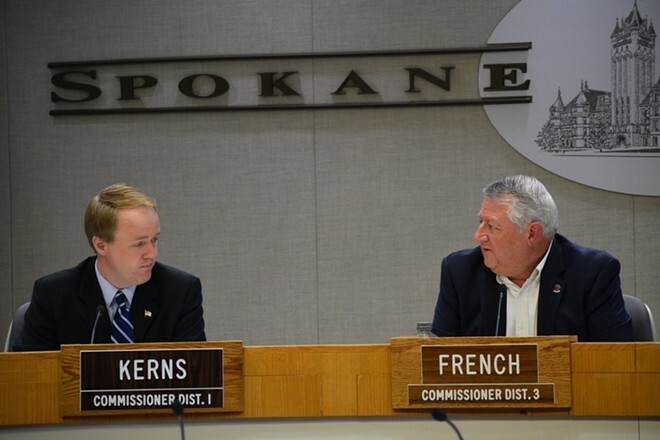 Spokane County commissioners Al French and Josh Kerns. A majority of the Spokane County Commission voted to make collective bargaining negotiations with labor unions open to the public — purportedly to increase government transparency. Representatives from unions, however, say they were blindsided by the move and criticized the change. The resolution, which was approved by commissioners Josh Kerns and Al French — Commissioner Mary Kuney was traveling on county business — on the morning of Dec. 11, mandates that all collective bargaining contract negotiations be open to members of the public and the media through on-site viewing or a video feed. (The public is explicitly prevented from participating in the negotiations, however.) Strategy sessions that don't involve direct negotiation between either party would be exempted. "The highest priced part of our budget is labor," Kerns tells the Inlander. "When we’re discussing and negotiating these types of things, the public should be able to see it happen." But the move has rankled local labor unions, who not only dispute the merits of the resolution but also allege that they weren't told about the resolution until the day it was passed. "It’s laughable that they’re touting transparency when they rolled this out under the cloak of darkness," says Gordon Smith, a representative from the local chapter of the Washington State Council of County and City Employees (WSCCC), the union representing Spokane County Prosecutors. "It's hot off the presses." In response, Kerns says that there is no "legal requirement" to inform the unions prior to making such a policy shift. He also disputes the characterization that labor was blindsided. "'Blindsided' is traditionally something used with a negative connotation," Kern tells the Inlander, adding that the resolution is something "very positive" for taxpayers and the unions themselves since members will be able to see in real-time what their representatives are doing at the negotiating table. The resolution also comes after roughly two years of lobbying from the Freedom Foundation, an Olympia-based libertarian think tank that routinely spars with unions across the state on a variety of labor issues. "Matthew Hayward, outreach director for the Freedom Foundation, tells the Inlander that he first broached the idea of making Spokane County's collective bargaining negotiations public to Commissioner Kerns back in December 2016. (He and other Freedom Foundation staff continued to meet with various Spokane County commissioners through 2018.)" The organization was also shopping the idea around to other cities and counties across the state at the time. Lincoln County was the first jurisdiction to open collective bargaining to the public, followed by the Pullman School Board, Ferry County, the Tukwila School Board and Kittitas County. "They were going all over the state, meeting with different legislative bodies, county commissions and city commissions all across the state, explaining what the reasoning was," Kerns tells the Inlander. But the efforts to open up bargaining in some of these jurisdictions have run into opposition from labor unions, who argue that public bargaining will make it harder for both sides to have frank conversations and that the measures themselves violate standing state labor law. In Lincoln County, Teamsters Local 690 filed several complaints with the Public Employee Relations Commission alleging unfair labor practices. "We do not believe the state statute supports open forum bargaining for public sector people," Val Holstrom, secretary-treasurer for Teamsters Local 690, tells the Inlander. "The board should know that they can't implement something like this without obtaining the union's agreement first," Smith of WSCCC says. "They have to work with us first." Spokane County Commissioner Al French says that the county's legal counsel believes that their resolution will withstand scrutiny. "That’s why we felt comfortable moving forward with it." The notion that the Freedom Foundation — which Smith calls "anti-union"—worked closely with the Spokane County Commissions and other jurisdictions across the state to open up collective bargaining is also concerning to union leadership. "These things are backed by an outside national group and I personally don’t understand why the county commissioners, if they have no real skin in the game, are promoting someone else’s national agenda," Holstrom says. "Are they representing the Freedom Foundation and their interest or the interest of their constituency?" Hayward of the Freedom Foundation tells the Inlander that while they promoted the idea to the Spokane County Commission and gave them some draft language of the resolution to work with, they weren't closely involved with the rollout of the measure. "They definitely did tweak it on their own and we never saw what they put out until they sent it out," Hayward says. "It was a fairly hands off approach in terms of the passage of it." "We ended up tweaking it so it was specific to Spokane County and incorporates the advice of our legal counsel," French says. While Smith of WSCCC isn't personally adamantly opposed to the notion of opening up collective bargaining to the public, Holstrom, of Teamster Local 690, is opposed because of how members of the public may misconstrue the negotiations. "It opens the door to a lot of miscommunications and misunderstandings when it comes to the bargaining process," he says. "Things happen in bargaining [that] you discuss that may not see the light of day." Toby Nixon, a board member of the Washington Coalition for Open Government, doesn't sympathize with union concerns with making collective bargaining public. "Sorry, but you’re there representing the public, the public has a right to know how their decisions are being made," he tells the Inlander. "I generally don’t buy this argument that people aren’t going to have frank conversations if the public is present."